With the iPhone 5S and iPhone 5C announcements, bargain shoppers and deal hunters must have been salivating at the possibilities of cheaper or free iPhones. That option is here with the free iPhone 4S, but we're warning you against that route. When Apple announces its new iPhone model each year, it usually means a previous version becomes cheaper. The older models are generally a good deal, but this time around it isn't. Slap the word "free" onto the iPhone 4S and suddenly you have an enticing deal. It has a retina display, a nice camera and solid battery life. But alas, it also comes with only 8GB storage, which is practically nothing these days. Think of all the photos and videos you'll shoot, or the fun apps and games you're going to be downloading. Where do you think all that stuff will go in an 8GB smartphone? Nowhere, that's where. In terms of specs, the iPhone 4S is a bit antiquated now, too. Think about it, for just $99 more you can get what's essentially an iPhone 5 with a plastic, candy-colored shell in 16GB or 32GB variants. That amount of money is worth saving you the headache of running out of space in the long run. One lesser factor to consider is resale value: you're more likely to get more cash for an iPhone 5C down the line than you ever will for an 8GB iPhone 4S. These days, it seems like even 16GB isn't enough storage for a smartphone. Camera resolutions are increasing, and so is video quality. That means we need more storage along with our apps and the other junk we stuff into our phones. Few things are more irritating than finding yourself trying figure out which apps, photos and videos you keep, and which ones you should delete to save space. Sometimes you hit that wall just a few months after purchasing a new phone. When it comes to iPhones, when you commit to a certain storage capacity, you are committed to it. Neither the iPhone 4S or iPhone 5C have expandable storage (i.e. microSD card slots for more memory). If you want an 8GB phone now just because it's free, make sure it's the same 8GB you can live with two years from now when you can upgrade again. Perhaps we're getting a little too preachy, but if budget is your deciding factor when buying a new smartphone, give the iPhone 5C more consideration. You're getting a newer phone with better specs and more memory for - in the grand scheme of things and the duration of your contract - hardly any money at all. Some of us spend more on coffee each month than the contract price of a phone. 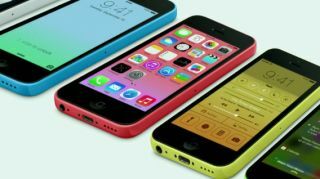 Between the two non-iPhone 5S smartphones that you can buy on September 20, the 5C is really your best bet. But if you don't think you're going to be downloading a ton of apps, and you never shoot photos or videos on your phone, the iPhone 4S might be a decent shot. After all, you're still getting a quality device for nothing besides a two-year contract. Let's not forget that just a little over a year ago, the 4S was Apple's flagship device. In the end, we strongly feel that anyone who wants a smartphone isn't ever going to be content with just 8GB of storage. You may try to reason with yourself now since free stuff is hard to pass up, but your needs will change along with new trends in the industry, and you'll end up kicking yourself for it. Oh, and one more thing: There is also a good chance that app developers won't support your phone anymore. You wouldn't want to be left behind with no memory to spare, would you?